Initially, a group of Lafayette Community members came together to form the Local Foods Group under the inspired leadership of local “green” activists. From 2008 through 2011 the group searched Lafayette for an appropriate site to establish a community garden and outdoor learning center. 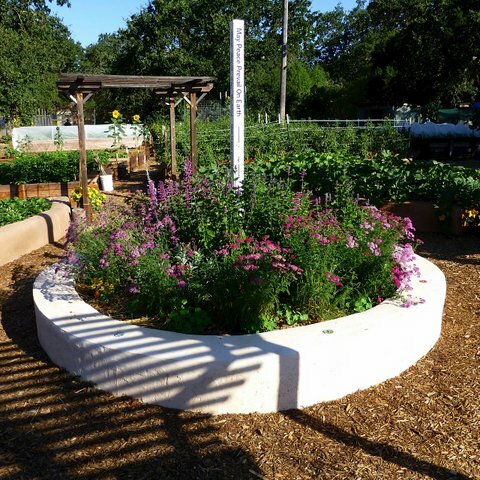 The goal was to create an inviting community space where citizens of all ages could grow and share food collaboratively and learn about sustainable gardening practices. In February of 2011 the City of Lafayette and EBMUD (East Bay Municipal Utility District) agreed to allow the community to use the current site across from the Lafayette reservoir. Sustainable Lafayette agreed to be the fiscal sponsor and generous private donations enabled the ground to be broken in March of 2012. Now having secured the space, the group talked to members of other community gardens to glean their advice as to how to best proceed with the organization of the garden. 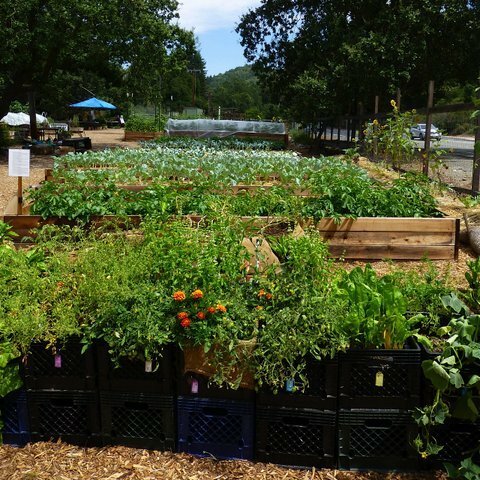 A major mentor in the beginning was the founder of the nearby Moraga Gardens. He helped tremendously in steering the group to form a flexible set of organizational guidelines capable of being modified by the gardens many future participants. Another important goal for the garden was to create a beautiful space that would give Lafayette an aesthetically pleasing destination for residents to come together in their community. Artwork and design ideals would be incorporated throughout the planning and building of the site. Several local landscape architects lent their talents and skills in guiding the group to its initial design layout. We hired an inspirational garden manager who was instrumental in achieving the overall artistic feel of the garden. She and her partner designed the beautiful entry gate which serves as a welcoming, organic gateway. 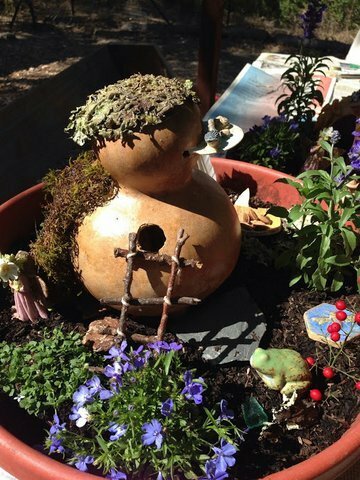 She was also responsible for seeing that the donated Dannenbeck tiles were incorporated throughout the garden, adding a little colorful magic to stucco walls and wood beams. Her thoughtful design decisions can be seen everywhere in the organic flow of the garden’s planting beds and paths. Initially the garden was governed by an active advisory board. From April to November, they were joined by fifty inaugural families, along with Boy and Girl Scouts, a church group, and a host of volunteers to build a greenhouse, shed, and garden beds using a variety of recycled and donated materials. A number of different crops were grown and shared during the season. Much was learned by trial and error--and much fun was had by all in the process. A series of educational workshops were successful and began to fulfill the role of the garden as an outdoor educational environment open to the public. The Earth Day Open House and Fall Harvest Festival provided the community with fun gatherings to experience the garden’s many offerings. As of 2015, the garden is in its very productive fourth season, and has matured into an attractive, thriving space for all to enjoy. Chickens have been a welcomed and lively addition to the garden this year. 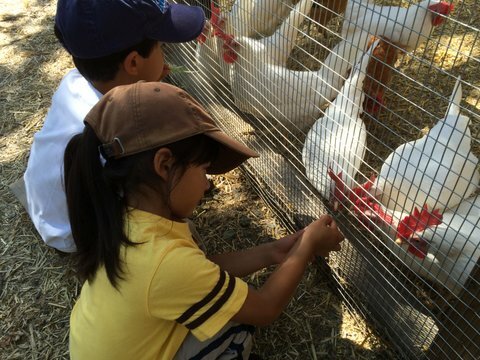 Fresh eggs and an abundance of organic produce have been enjoyed by all! The garden is sustained on a day to day basis by a cooperative community of members who work under the direction of our Executive Board Chairperson, who helps manage the garden along with the Committee Leaders. It is governed by an Executive Board made up of active and associate Garden Members. 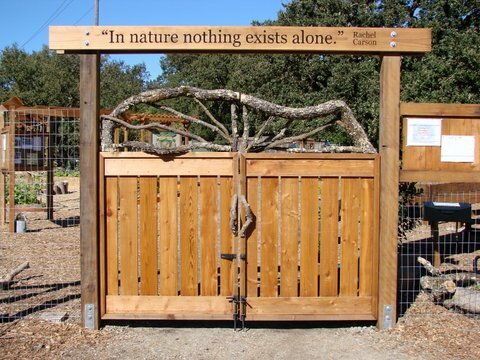 The beautiful and welcoming garden gate was designed by the first garden manager of Lafayette Community Garden. The Lafayette Community Garden peace pole, surrounded by a raised bed of flowers. 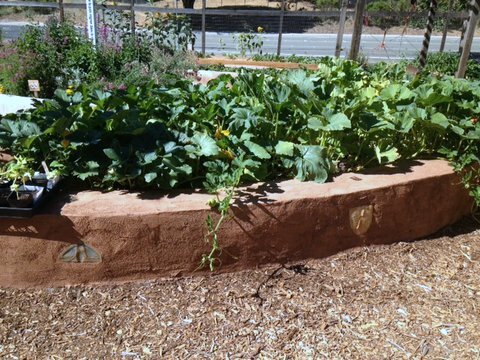 Many of the garden beds are constructed with stucco and decorated with tile. 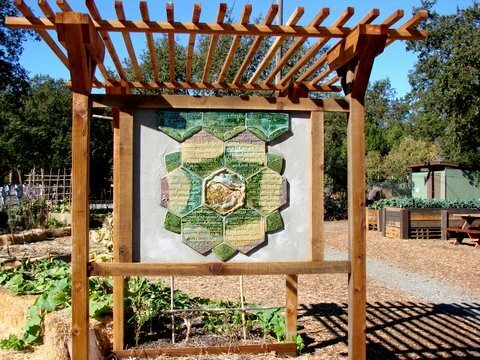 The Seedlings Donor Board at Lafayette Community Garden in Lafayette, California. Flatbeds and milk crate garden beds (front) in the Lafayette Community Garden. 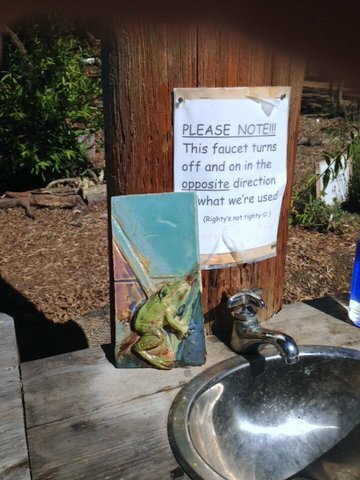 A donated Dannenbeck frog tile rests next to the hand washing station. 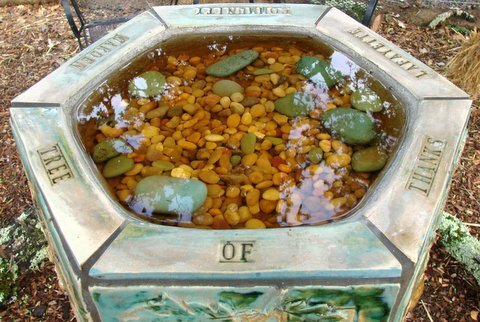 The hexagonal bird bath ornamented with tiles serves to thank donors for their contributions and beautify the garden. 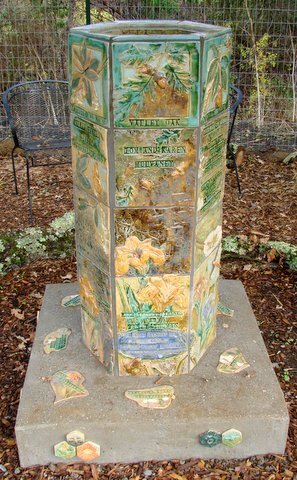 "The Lafayette Community Garden Tree of Thanks," a tiled birdbath recognizing donors. 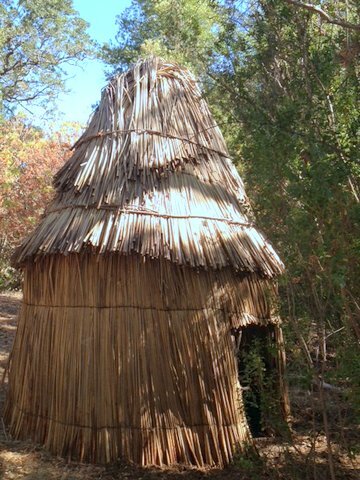 A traditional Miwok hut on the grounds of the Lafayette Community Garden is used as an educational space to celebrate the Saclan and Miwok American Indian culture and history. The Blue Bottle Tree was installed in the garden in July 2014 and designed by artist Suja Pritchard. Pritchard also led the "Small Worlds Workshop" at the garden. "Gnomes and Fairies Welcome!" from the 'Small Worlds' workshop given by artist Suja Pritchard at the garden. 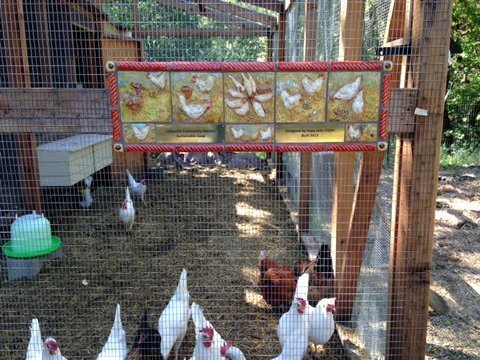 A tile mural featuring chickens greets visitors to the chicken coop and yard at the Lafayette Community Garden. Young garden family members caring for our seventeen resident chickens. 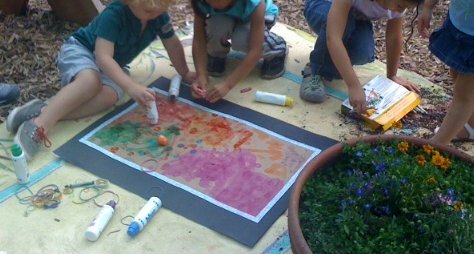 Children creating a mural at the garden.